I’m always one to say, that whatever your eye colour is, use whatever colours you like. And many colours actually do suit different eye colours. But for someone just starting with makeup and eyeshadow, it can be helpful to know a little something about eye colours and how to pair them with the best suitable colours. In this post I will give you makeup tips for blue eyes. I love blue eyes – there is just something mesmerizing about them – no wonder my man has beautiful big blue eyes. Blue is also an easy colour to bring out, and you can enhance your eyes with eyeshadow colours. Basically you just need to use some knowledge you have about colours and pair them accordingly. Also an important note is this: Is your eye colour more warm or cool -toned? If it’s cool, you can use warm colours, to get the biggest impact – or cool colours, if you want your look to be more harmonious. What colours suit blue eyes? The complementary eyeshadow colours are bronze, golden and orange, so basically you can’t go wrong with warm brown shades. Blue as a colour is somewhat cool, so pairing it with warm complimentary colour really makes it stand out. You can also try analogous colours, such as blue or purple eyeshadow for blue eyes. That doesn’t make the eye colour stand out as much as using complementary colours, but it looks really nice and harmonious. Another great colour for blue eyes is grey. It makes your eyes look super icy blue and it’s great for those, who prefer cool tones. What if my eyes are blue AND green? I feel you, and I’m one of those people. Basically you can bring out the blue in your eyes using these same tricks and you can also follow the rules for green eyes, to bring out the green in your eyes. It’s a win win! I find that since my eyes are blue-green and leaning more to warm than cool – I can make the blue in my eyes stand out the most with cool tones such as purple (maybe that’s why it’s also one of my favorite eyeshadow colours). 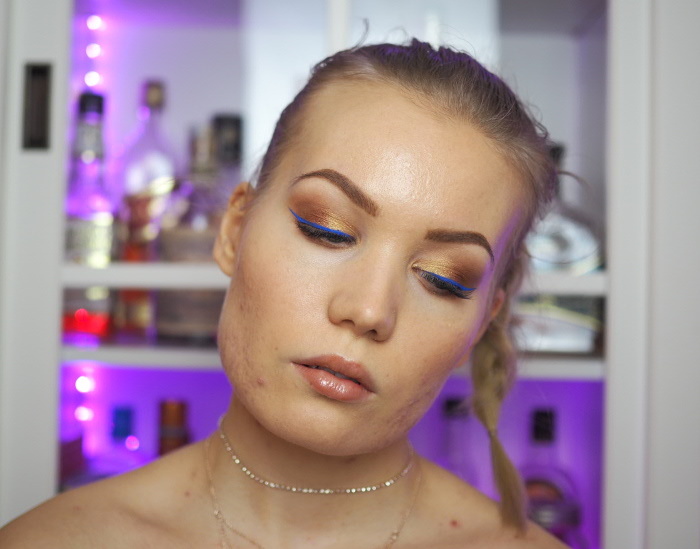 This makeup tutorial is a very basic tutorial for blue eyes – I’m using warm brown colours with gold and bronze. These colours really make the eye colour pop! I also paired this look with a fun blue liner (I just couldn’t help myself, since I got this new liner as a present and I’m obsessed with blue), but you can obviously skip that or replace that with a regular black liner. Step 1: First, apply a light warm brown shade on your lower lashline and on your crease-area as shown in the photo. Take a darker shade and deepen that colour. This is your eye shadow ‘base’. Blend these colour well. Step 2: Apply a bronze and a golden shade on your lid, half and half. Pat it on to get the most pigment. Step 3: Apply some light shimmer in your inner corner and line your eyes. And there is that! Any blue-eyes ladies out there? What is your favorite eyeshadow colour? Any favourite palettes? This makeup and my photo with the visible acne/scarring got a lot of likes on my insta (@charlottaeve). 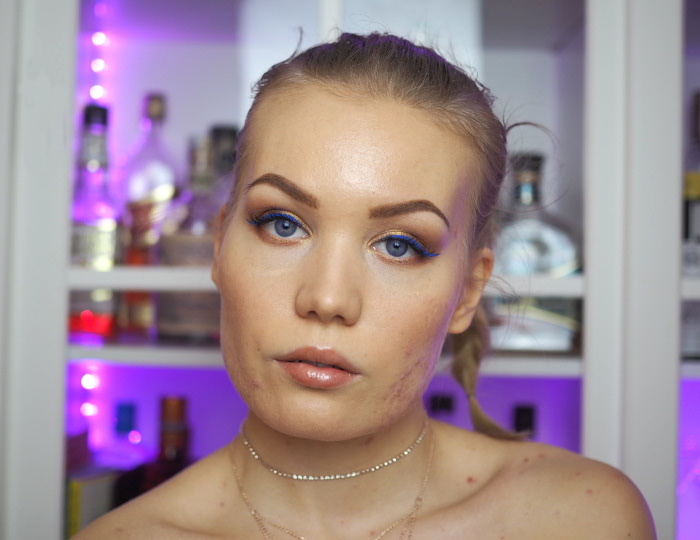 I’m still proudly wearing my imperfect skin – and didn’t want to edit it for this tutorial either. Makeup is about so much more, than being perfect. 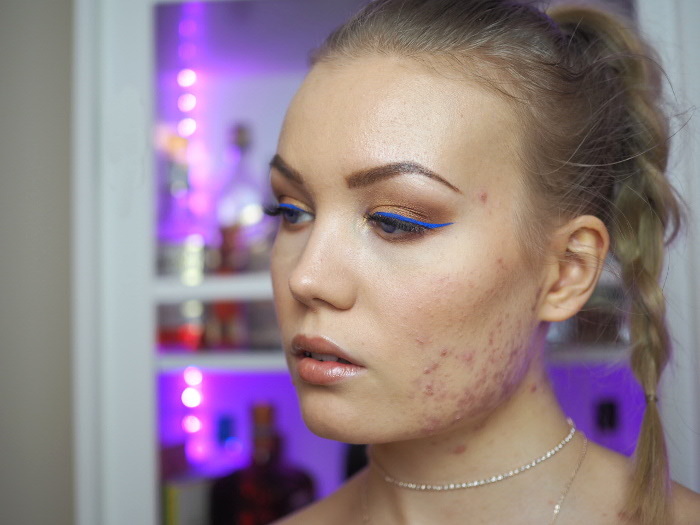 For anyone suffering from acne: don’t let it stop you from playing with makeup and enjoying it.